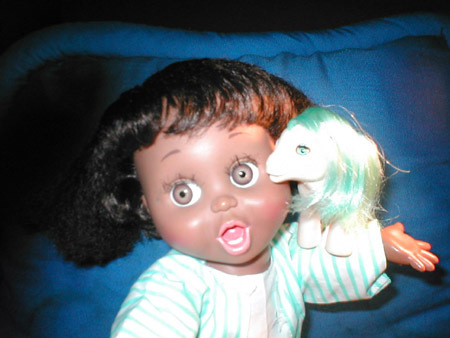 My very first Baby Face was a black So Surprized Suzie I got as a Christmas present from my grandparents. I'd seen the commercials and i thought that the dolls were just beautiful, and so when I asked for one for Christmas, they obliged me. (I remember this distinctly because after that they didn't get me any more toys for Christmas.) I was actually upset at first, because I'd asked for Black Natalie, not Suzie, and my grandmother's known for just getting the first thing that's close to what I asked for. 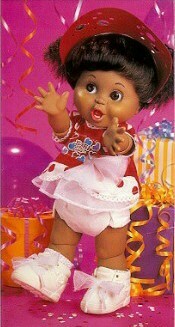 But I still loved Suzie--after all, she was still one of the Baby Face dolls. I kept Suzie in fairly good condition, barring the fact that she went everywhere with me I lost her hat, socks, and one shoe. (Yes, just one, though I suspect it might be lurking in my house somewhere.) I also ripped all the vinyl off her diaper. But I did keep her top. She had (and still has) dozens of outfits I designed especially for her. And boy was her hair messy! I took her in the bath with me all the time and washed her hair, and it dried out badly. It's never been the same glossiness it once was. She also got marks on her--accidental, and not too big, but still. And boy, are her eyelashes twisted up! They'll probably never ever be the same again, but I'm much too lazy to bother trying to fix them. Welcome to obsession! Not only were many of her sisters on Ebay for buying, I found site after site dedicated to my Suzie and her sisters--ones I'd never heard of or seen, Bathtub Babies, and the story of how Baby Face came to be from the inventor himself. So being a person who keeps searching for knowledge, I sat and read the whole story. Talk about happiness. I just knew that I wasn't the only one out there with a Baby Face, and I immediatly started bidding on baby Faces so Suzie would have company and friends to play with as soon as I could get to my storage unit. I finally got her out of storage--by now I had a Cynthia, Sandy, and Suzie, and a Penny on the way. Suzie came home to a gang of girls ready to say hi.